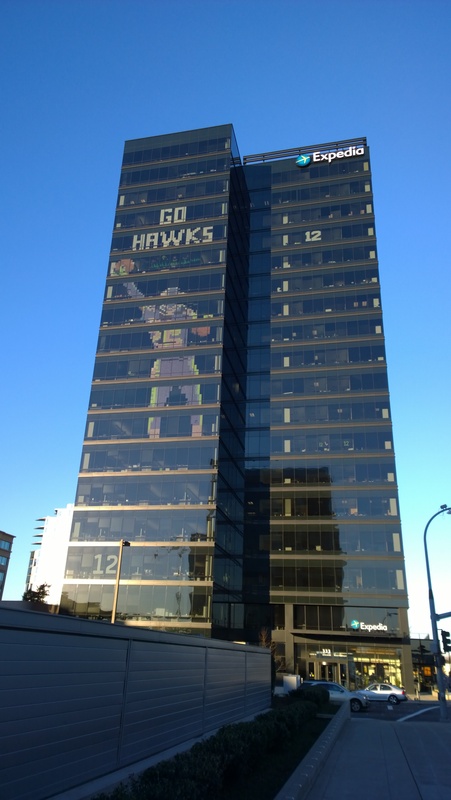 Employees celebrated the Seattle Seahawks’ Superbowl journey with a 9 story image on the side of Expedia HQ. We have a lot of Seattle Seahawks fans at Expedia and as you can imagine, there was a lot of excitement at Expedia HQ in the days before and after the Hawks’ historic Superbowl victory. We made the local and national news when a group of employees stayed after work a few days before the Superbowl and created a 9-story-high image of Seahawk Richard Sherman’s “immaculate deflection” in the NFC championship game against the San Francisco. The KLM iPad app, with its animated map globe, is attractive and engaging. It has one feature I’ve never seen on a travel app before: a filter for destination temperatures. The app also features Facebook integration; you can tap friends’ map markers to check flight availability to their locations. This is a cool list of sort-of overlooked destinations. I agree with the London-Edinburgh item; Edinburgh to me was a tiny gem of a city. This article made me laugh. In 2011 I was the idiot in Quito, Ecuador, who assumed that a cloudy day on the equator wouldn’t scorch my fair skin. I was wrong. Of all the “bucket list” trips, the Northern Lights are the most-wanted. And since it’s Northern Lights viewing time of the year, maybe you’ll have better luck than I. My one attempt in 2010 to view them in Iceland was a bust due to warmer-than-average weather. Being a tourist rocks. For me, #1 (Eating like a feudal lord, yet still losing weight from all the walking) is one of the greatest reasons. As a former Disneyland cast member at Christmastime, I miss Hunky Santa. ‘Nuff said. More holiday cheer! I just returned from Denmark, and their Christmas Markets were lovely. Here’s some of the best around the world. …and a good article on avoiding the flu and germies on the plane. Arthur Frommer is a travel legend, and something of a grumpy old man these days. Here is his list of his most frequently asked, yet “most painfully obvious to answer” travel questions. Ever wanted to travel just for a festival? I highly recommend- we hit Rio for Carnival a few years ago, and Munich’s Oktoberfest is on my to-do list…. …and My Copenhagen Trip Report ! I just returned from 10 days in Copenhagen, Denmark and Malmo, Sweden. We stayed at a local’s apartment in Copenhagen through AirBnB.com, and at the flashy new Generator Hostel Copenhagen. I highly recommend both. If you’d like to read my trip blog, click the link. Mobile devices will enable new personalized services using protocols such as Apple’s iBeacon (more than one contributor mentioned iBeacon, but given that the iPhone’s worldwide market share fell to17.6% in Q4, firms will want to be ensure that their implementations work well with other mobile OSes including Android). Mobile and a seamless experience across devices were highlighted. Expedia’s world-wide hotel inventory is being made available through eLong, offering hoteliers across the world access to the fast growing outbound China travel market. Congratulations to Team Expedia on rolling out these great features. I was fortunate to observe the development of a couple of these starting with their conceptual phase. It’s great to see them launch. Expedia’s ScratchPad feature holds user history and other information and makes it accessible across multiple devices. For users to take advantage of the feature, they will have to log in on each device. Some of the commenters to the article doubt that large numbers of users will log in. Indeed, that will be one of Expedia’s challenges in gaining adoption. Expedia will need to sell users on the value of logging in. I’m not as pessimistic as the commenters; I would bet a large number of Amazon sessions are logged in. This is a key competitive strength for Expedia since it has far more data than most suppliers and can provide a value-add that suppliers cannot replicate through direct channels. Top gains in share price were realized by (in order) Orbitz, Ctrip, TripAdvisor, Priceline, MakeMyTrip, eLong and Expedia. In response to EU competition concerns, Google proposed to offer competitors the chance to bid for second-place positioning in search results, below Google services. Google’s competitors say that’s not good enough and EU regulators agree. Google mines your Gmail account for information such as travel reservations and shows the relevant information on Maps for mobile when pertinent. Some interesting factoids on mobile travel data. Last year, mobile internet data was 12 times the size of the entire internet in 2000. The travel industry is really a small world at the global level. By putting some effort into networking, you can build strategic relationships with important players across the industry. Summary and infographic on hotel distribution strategies. Unlike some hospitality-directed advice, this one calls for partnering with OTAs. Too many hospitality sector advisors do not acknowledge or understand that properly used, OTAs can increase overall revenue by providing incremental bookings that cannot economically be realized through other channels. This is similar to legal actions OTAs and hotels have faced in a number of venues. The wheels of justice turn slowly: this story was reported in mid-December and I could find no new reports as of early February. Clearly, hotel distribution, marketing and management is a complex business. Hoteliers need to field great management execution and expertise in these areas if they want to enjoy good revenue. This will be achieved by learning, consulting with experts and building great staffs, not by engaging in blame games against “revenue stealing” online travel agencies. Airbnb has recognized that it needs to move beyond enabling a peer-to-peer marketplace to managing the hospitality afforded to guests. Airbnb created a “Head of Hospitality” position and hired experienced hotelier Chip Conley to fill it. In this interview, Conley explains how Airbnb will work to ensure hospitality. Google is offering hotels the chance (for a fee) to use its Street View technology to create virtual tours of their premises. Besides Street View photos of properties, Google is offering payments through Google Wallet to hotels. I understand why Abu Dhabi is doing this but I don’t agree that they should. Less experienced users may mistakenly believe that star ratings indicate a hotel’s quality, but the industry convention is that they reflect the quantity and richness of amenities. Most websites and apps indicate quality of service and infrastructure through review scores. Star ratings and reviews are two different scales; combining them reduces the amount of information available to users. If I can only afford a 2 star hotel, I want to be able to easily find the cleanest, best-serviced 2 star hotel available. Using two scales makes that exercise easier. Length of reviews by language: Russian speakers are the most verbose at 879, followed by English at 528. The newest aircraft designs are significantly more efficient than their predecessors. Since fuel is the airlines’ greatest cost, the increased efficiency plus opportunities for ancillary revenue offered by the new airframes are driving record purchases of new aircraft. We all know that flying economy class has its drawbacks, especially when the person in front of you throws their seat back as fast and hard as they can. In economy, I would actually prefer the non-reclining seats that a few airlines are now offering. The new American airlines is making an amazing offer to its employees and families: free coach class flights–and they don’t have to fly standby. Prices start as low as $1.95 for flights under two hours. At that price point, a lot more people will be willing to try out in-flight Wi-Fi. Nobody but JetBlue seems to think the airline did the right thing by suspending operations In Boston and New York for 17 hours from January 6th to 7th.The airline may have been more sensitive than its competitors after enduring extensive criticism over long delays during bad weather in February of 2007. Do You Know the Most Dangerous Airports in the US? The CEOs gaze into their 5, 25 and 100 year crystal balls and offer a mix of logical, fanciful and downright silly predictions. A father sets his baby down on a table while retrieving his belongings from security. While Dad is momentarily distracted, the baby topples off. Watch as a TSA agent makes a diving catch worthy of a pro football receiver like Golden Tate. Airlines charge an extra fee for unaccompanied minors, but it’s likely that United doesn’t think the revenue offsets the risk, now matter how remote, that it might mishandle another child’s itinerary like it did in 2012. I lived in Chile many years ago and would love to make a return visit. However, in checking airfares over the years, I’ve always found the air fare to be a bit higher than I’m willing to pay for a casual trip. For example, checking prices four weeks out from the time I’m writing this, the lowest fare I see from Seattle to Santiago is $1341. The lowest fare I see to Hong Kong, which is almost exactly the same distance from Seattle, is $758. This article lays out some reasons that there are so few low cost air carriers in Latin America. One of the reasons is the formidable presence of LAN, one of the biggest carriers in the region. I like LAN, but its market strength makes it hard for low cost carriers to gain traction. Another issue is that there is a lack of secondary airports and terminals in the region. Brilliant PR move on the part of Alaska. Offer a wide variety of vehicles, from economy to luxury, that people would drive by choice. Cars should be conveniently available close by for pick up. Price needs to be low. People are more open to sharing rides with others when all are members of a common group, such as students at the same university. SkyCycle would be a 136-mile (219 km) systems of elevated bicycle lanes, built above existing rail lines and taking 20 years to complete. “With the holidays over, many people all over North America are gazing out their windows at the icy weather beyond with one thought in mind: Get me out of here. The travel agents say so. No word in this article on whether many young people agree. This is pretty good selection of 2013’s top travel stories, including the acquisitions of Kayak and Trivago, American Airlines merger, The FAA’s new pilot rules and Travelocity outsourcing to Expedia. I’m not sure this really includes the 17 most influential people in travel, but the people on the list are certainly interesting in the context of the industry. The number 1 story was the unexpected drop in the age of hotel guests. Empty first class seats used to go to elite status frequent flyers. Now airines are increasingly selling them to the highest bidder instead. A passenger with no status at all can sometimes find a first class bargain. Revenue from bag fees was actually down $95 million from 2012–perhaps more passengers have opted to fly with carry-on baggage only. The popular comic strip Crankshaft skewers airlines for their overzealousness in monetizing everything. “Content marketing” is one of the hottest promotional trends today. Organizations engage in content marketing by creating original content or actively participating in content curation, editorial and/or production. Content market is hot due to the growth of DVRs, the decline of print news and trends like time shifting that reduce the efficacy of traditional advertising. Examples of content marketing include Red Bull’s space jump video and any number of YouTube sponsored video channels. Companies can build brand awareness and equity by associating their products and brands with compelling content. Travel companies are among those turning to content marketing. Marriott is partnering with Fast Company, Mashable, and Wired as part of its content marketing effort. Colors need to be true-to-life or customers will think images have been manipulated. Images need to be mobile-friendly. Hotels should provide lots of images–TripAdvisor says that properties with more than 20 photos get 150% more engagement. Make sure to click through the slideshow at the top of the page to see the sites. Keep in mind that “best designed” is fairly subjective. Just to take one example, I find GoHawaii.com to be as well designed as some of the sites chosen by Skift report Samantha Shankman. You might say that Zuckerberg is an anti-HiPPO. Informative chart–you can resort by column to see a stack rank of Twitter, Facebook, YouTube and Instagram followers. There is a popular meme that young people are abandoning Facebook as it becomes popular with their parents and other “old” people. This article suggests that this is untrue. Some Instagram users are experiencing “Instagram Envy” when they view images of beautiful destinations and elegant exotic meals appearing in their feeds. Search on hashtag #MyDubai to see what’s happening in the constantly transforming emirate. Good writing contributes to success in media regardless of the era in which it was created. It will surprise no one that New York is number 1. The Travel List Challenge’s 100 Places to Visit Before You Die – How many have you been to? Click all the places you’ve been to to see your score. The New York Times’ annual “Places to Go” is one of the most influential destination features published each year. This year’s edition includes some short video sequences à la Vine and has some very compelling destinations. How do they decide what destinations to include? Skift interviewed Dan Saltzstein, the New York Times editor responsible for “Places to Go” to find out: How the New York Times Travel Section Makes its ‘Places to Go’ List. There are some beautiful pictures in Rough Guides’ top 10 countries for 2014. Some notable picks include Ethiopia, Madagascar, Bulgaria and the Philippines. Some beautiful destination photos here, worthy of the National Geographic moniker. If you accept today’s commonly understood meaning for “travel blog” Jeff Greenwald has a good claim to have written the first one. In 1994, he traveled 30,000 miles through 27 countries and uploaded 19 posts using a glacially slow dial-up modem. Note: You will need to view this immediately after clicking the link. NBC’s video player moves on to another video as soon as the first video is complete. Utah offers some experiences no other ski destination can match, like getting from the airport to a good number of world-class resorts in under an hour. And there are some real bargains for skiers on a budget. Don’t watch this if you get vertigo! Peru & Bolivia: a stop motion journey. I don’t know what to think of this one. Beautiful scenery, and all the stop motion was obviously an incredible amount of work, but it both detracts from and enhances the video. Somewhere USA. An impressionistic montage of road trip clips. Graduate students in economics are increasingly foregoing academic, government or consulting gigs to join online companies. Economists find tech firms’ fast pace and large, rich behavioral data sets extremely attractive. A series of informative maps distort country sizes to help viewers visualize population, GDP, healthcare spending, energy consumption and more. This New York Times Article gives as good an overview of the leadership changes at Microsoft as any I have read. Personally, I think Nadella is probably the best choice they could have made from the list of rumored candidates. During my time at Microsoft, he was usually seen as a respected, if somewhat quiet, leader. Having Bill Gates shift from Chairman to becoming a technical adviser to Nadella should ease the transition. Java was by a long stretch the most frequent skill employers searched for in 2013. If you’re a programmer looking to maximize your employability, Java skills can be very helpful. This is good news for companies like Expedia that use CentOS Linux to host production applications and services. It provides greater assurance that CentOS will be supported in the long term and provides a clearer path for technical support should users need it. Startup Oculus, founded by a teenage genius, has set the tech cognoscenti buzzing with the advances it has made in virtual reality gear. The biggest breakthrough Oculus has made is to reduce latency to the point that humans cannot discern it. This is a key advance because latency can induce a sort of motion sickness in many users. Oculus’ prototype was the winner of the official “Best of CES Award at the Consumer Electronics Show. Many such lists appear at the end of the year. Of all the ones I saw at the end of 2013, I think this one came closest to representing the best of the year. Overstock.com is the largest and most prominent retailer to begin accepting Bitcoin. Overstock is accepting Bitcoin through a partnership with Coinbase, a Bitcoin wallet. Bitcoin has garnered a lot of attention recently. The article offers a good overview of Bitcoin and it’s risks and promise. …and it looks just like something you drew with that Spirograph you had as a kid. Spirographs aren’t just art tools; they are visualization engines, invented by a mathematician.